The past few days my brother Ross and I have been closing up our childhood home in Rhode Island and preparing it for sale. The process began just before Christmas when our 92-year-old mother fell and spent time in a nursing home. Over the last 16 years since our Dad’s passing, Millie, our mother, has fallen and injured herself several times and defying expectations always returned to her home. This time it felt different. One just doesn’t bounce back as quickly at 92 (as compared to being a youngster of 85). Plus the record snowfall of 2015 had rattled her confidence in living alone. Mom made the decision to move to Florida where my brother is. As she said: “It’s time and it’s warmer there.” In February Millie moved and celebrated her 93rd birthday. She’s begun to make friends and recently gave my brother and me the go ahead to put the house up for sale. Closing up a home brings up memories. 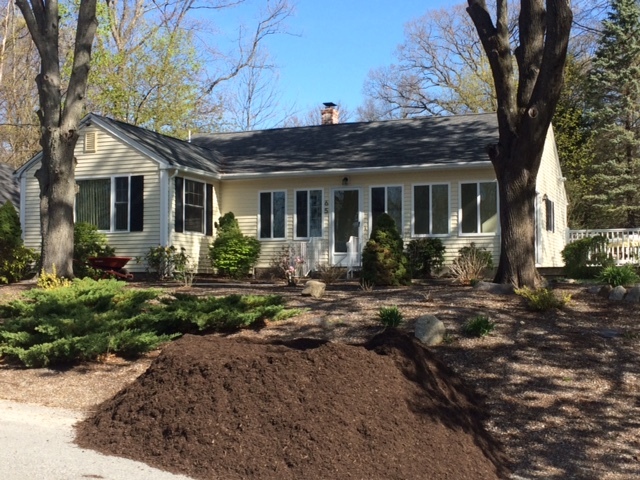 As Ross and I put down 20 yards of mulch (for curb appeal) we reflected on our childhood. We are still somewhat amazed at how much freedom we had. The only rule we recall during the summer of our boyhood was that once breakfast was over, we were expected to return for supper at 5 p.m. (Lunch was at a friends or we took with us). This seemed to be the norm for other kids too. In between we played sandlot games, wandered in the nearby woods and wetlands (which we called Smokey Bear Land). During the winter we’d walk two miles to play hockey on a pond (in the middle of an old pig farm). I don’t recall ever having a parent with us. For kids this was great, it was a time of adventure and exploration. But at the end of the day we always returned home. Supper was always waiting and our Mom and Dad were there, listening to our stories and adventures. Lots of good memories surround that home and neighborhood. Difficult and painful memories too that linger on. All these memories, happy and painful are part of me, of my family and the house that we are putting up for sale. Over the past few days neighbors have stopped by. 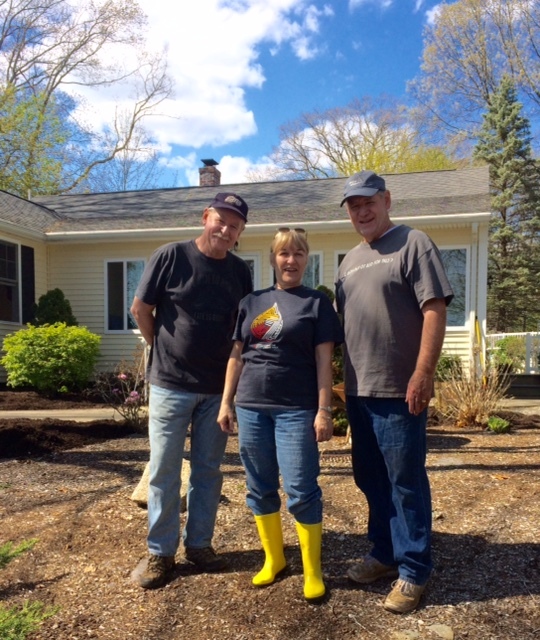 Ginny (pictured with me on the left and Ross on the right) with whom we grew up, helped us by power washing the deck. Ginny with her husband Mike moved back to her childhood home and have been great neighbors. Our cousin Tom stopped by to lend a hand and take a few of our Dad’s tools (which would please him). Sue, Paul and Sammy from down the street, stopped by to wish our family well. Millie remained in her home for so many years after our Dad, Norman’s death, because of good neighbors and family who helped Millie know she wasn’t alone. In 1948 Norman and Millie built this house with their own hands, raised a family and became part of the community. Now it’s time to say good-bye. May whoever buys this house make it their home. May they too create memories that will last a lifetime. Richard Nixon, Where Have You Gone? I agree Joe. Roots go deep. Great piece, Kent. I expect to be traveling the same road soon enough…thanks for showing the way! Tom, thanks for walking with us down this road with Millie. You and Doreen made the way easier. And, Tricia and I will be there for you when that time comes. We cried for days when my Mom finally sold the little Calgary bungalow we grew up in. I still drive past it whenever I get back there. I was delighted to discover that it was purchased by a gay couple who did some very creative things with a very tiny house on a very dull street! Rob, love your story! I guess the family home will always tug at our heart. Beautiful. Happy. Sad. Heartwarming and Nostalgic. Life is nothing but a quilt of memories! Thanks Kent, love your blog! Thanks Lisa, our love to you and Helios!